January 26, 2007John F. Kennedy Space Center Americas gateway to the universe Spaceport News http://www.nasa.gov/centers/kennedy/news/snews/spnews_toc.html Vol. 46, No. 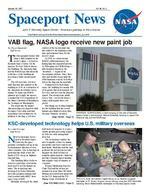 2 VAB flag, NASA logo receive new paint jobKSC-developed technology helps U.S. military overseas By Cheryl Mansfield Staff Writer T he star-spangled banner will shine a little brighter in the rockets glare  at least at Kennedy Space Center. On the massive 52-story Vehicle Assembly Building, the American flag and the NASA logo that adorn the south face of the building are receiving a badly needed paint job. The 209-foot-tall, 110-footwide flag was first painted on the building in 1976 in celebration of the American Revolution bicentennial. To make sure NASA planners got it right, the agency consulted the U.S. Department of the Armys Institute of Heraldry at the Pentagon in Washington. The result was the largest American flag ever depicted, with its stripes 9 feet wide and stars measuring 6 feet in diameter. In addition to the flag, a 110-foot symbol of the bicentennial was also added to the building at that time and remained there for the next 22 years. In 1998, to commemorate NASAs 40th anniversary, the fading flag was repainted and the 12,300-square-foot NASA logo  affectionately known as the meatball  replaced the bicentennial emblem. Since then, time and weather (especially the 2004 hurricane season) took their toll on the flag and the meatball. During back-to-back hurricanes, the building lost nearly 850 of its panels that each measure 14 by 6 feet, and not even the flag was spared. The strong storm winds took a bite out of Old Glorys stripes until repairs were completed. But things are looking brighter for the building that has served human spaceflight for more than 40 years. Painters elevated By Linda Herridge Staff Writer N ew technologies developed at Kennedy Space Center for the space program eventually end up in use by mainstream America or even other countries. One technology in particular has made it into the hands of U.S. troops in Afghanistan and Iraq. The Standing Wave Reflectometer is a prototype of an instrument used to test for failures in wires. The technology was developed by Pedro Medelius, associate program manager and chief scientist with ASRC Aerospace Corp. at KSC. Medelius developed the handheld meter in response to a space shuttle ground processing request in 1996 for cable wiring fault detectors. The technology enables the user to rapidly connect to wiring assemblies and detect and locate hard faults. Medelius said the unit performs the test in four seconds, displays the fault location in readable alpha-numeric characters and has computer-based training that requires only 45 minutes to complete. Eclypse Marketing Director Chris Teal said the meters are included in more than 250 battle damage assessment and repair kits for the U.S. Army and the U.S. Marine Corps. Fort Eustis in (See TECHNOLOGY, Page 2) (See PAINT, Page 3)PAINTERS SCAFFOLDING is seen hanging on the side of Kennedy Space Centers 525-foot-high Vehicle Assembly Building to repaint the American flag and the NASA logo. TWO U.S. Army servicemen inspect wiring on an Apache Longbow helicopter at Ft. Eustis, Virginia, during training using the ESP Hand-held Standing Wave Reflectometer developed at Kennedy Space Center. SPACEPORT NEWS Page 3 January 26, 2007THEMIS integration team eager to hear spacecraft separation SOLID ROCKET boosters (left) are clustered around the base of the United Space Alliance Delta II rocket. A total of nine boosters will assist in the launch of the THEMIS integrated spacecraft. EMPLOYEES PREPARE the integrated THEMIS spacecraft (below) for spin-balance testing at Astrotech Space Operations.By Linda Herridge Staff Writer W hen NASAs THEMIS mission lifts off aboard a Delta II launch vehicle from Cape Canaveral Air Force Station on Feb. 15, mission managers and workers at Kennedy Space Center will see more than three years of hard work come to fruition. Garrett Skrobot, a Launch Services Program mission manager, said there are 32 people on the mission integration team for THEMIS, which stands for Time History of Events and Macroscale Interactions during Substorms. However, there is an expanded team that supports the mission integration team during processing of THEMIS, Skrobot said. In all, there are more than 100 KSC workers involved in processing for this mission. Skrobot and the integration team are responsible for processing the spacecraft, including cleaning and fueling it and overseeing the spin-balance tests at the Astrotech processing facility in Titusville, as well as transporting THEMIS to the launch pad, and mating and encapsulating the spacecraft on the Delta II launch vehicle. Skrobot said every mission has challenges, and THEMIS is no different. The KSC integration team had to meet a requirement to deploy the five spacecraft using launch vehicle ordnance systems. The team also overcame the logistical difficulties of having members at multiple locations. The spacecraft bus was built at Swales in Greenbelt, Md., while the instruments were built and integrated at the University of California at Berkeley. KSC procured the launch services from United Launch Alliance in Huntington Beach, Calif., and the project is managed by Goddard Space Flight Center in Maryland. THEMIS is the first NASA mission to be flown by United Launch Alliance and the agencys first mission to deliver five science payloads into orbit. The closer you get to launch, the more you can feel the energy of the team continuing to build until you get to T-0 and the launch vehicle lifts off the pad, Skrobot said. This excitement continues until you hear the phrase spacecraft separation. At that point in time, you know that all the hard work that everyone contributed has led to the success of the launch phase of the mission, Skrobot said. According to Vassilis Angelopoulos, principal investigator at the University of California at Berkeley, the mission is part of the Explorer Program, NASAs oldest program and the agencys only one to receive a Nobel Prize. Other explorer missions included HETE-II, which launched on Oct. 9, 2000, and GALEX, which launched on April 28, 2003, both from Pegasus expendable launch vehicles. THEMIS will help to resolve the mystery of what triggers geomagnetic substorms, provide clues about the role of substorms in severe space weather and identify when substorms begin. During the two-year mission, the five identical probes will identify and track the magnetic field reconfigurations and energized particles that accompany the release of energy that occurs during substorms. Each of the probes will carry identical sets of five lowand high-frequency magnetic field and electric field instruments, as well as thermal and super-thermal ion and electron detectors, for a total of 25 instruments. platforms once again dangle high on the side of the 525-foot-high structure while workers use rollers and brushes to spruce up the flag and meatball  not a task for the faint of heart. In the end, the results will be seen for miles, and one of the most visible symbols of the launch complex will shine once more.PAINT . (Continued from Page 1) S pace Shuttle Program Manager Wayne Hale (pictured by podium) held an all hands meeting Jan. 19 in the Kennedy Space Center training auditorium. Hale reflected on the successes of last year, including the complicated STS-116 mission, and discussed the challenging space shuttle missions ahead of the Kennedy work force in 2007, beginning with STS-117 scheduled to launch in mid-March. For the latest information about the shuttle program, visit http:// www.nasa.gov Hale praises shuttle processing of 2006 and future SPACE SHUTTLE Program Manager Wayne Hale talks to Kennedy employees Jan. 19 during an all hands meeting in the training auditorium. SPACEPORT NEWS January 26, 2007 Page 7 Remembering Our Heritage By Kay Grinter Reference Librarian T he simulated countdown for AS-204, the first manned mission in the Apollo Program, was under way at Launch Pad 34 on Jan. 27, 1967. The crew was in position for the full dress rehearsal in the command module atop a Saturn IB rocket. NASA astronauts Gus Grissom, Edward White and Roger Chaffee made up that crew. Grissom was one of the seven original NASA astronauts selected in 1959, and he flew on the second manned Mercury flight in 1961 and on Gemini 3 in 1965. White was selected as an astronaut in 1962. On Gemini 4 in 1965, he became NASAs first spacewalker. The rookie on the crew, Chaffee was selected as an astronaut in 1963. AS-204 was his first flight assignment. At 6:31 p.m. on this otherwise ordinary Friday evening, the unthinkable happened. The vehicle rocked twice as the alarm Fire! was received from inside the capsule. Pad personnel scrambled to reach the White Room, but just six 40 years ago: Fire, regret at Americas moonport minutes later, when the inner hatch was opened, it was already too late. All three astronauts had died from inhaling carbon monoxide and other toxic gases generated by the flash fire. In the accidents aftermath, the NASA family was distraught. Flight Director Gene Kranz lectured his team at the Manned Spacecraft Center in Houston: From this day forward, Flight Control will be known by two words: Tough and Competent. Tough means we are forever accountable for what we do or what we fail to do. Competent means we will never take anything for granted. The Apollo 204 Review Board determined the probable initiator of the fire was an electrical arc in an equipment bay where instrumentation power wiring led between the environmental control unit and the oxygen panel. In April that year, AS-204 was officially designated Apollo 1, a mission number that had been used by the astronauts publicly and included on their insignia. Today, a small group of family and friends gather at Pad 34 at sunset on the anniversary of the accident to remember the three dedicated astronauts. Chaffees daughter, Sheryl, works as the administrative officer for Center Operations at Kennedy Space Center. It has sometimes been hard for me to work here at KSC, but I am proud to follow in my fathers footsteps as a NASA employee, she said, He was proud of what he did for his country, and I know he would support NASAs mission to return men to the moon and on to Mars.APOLLO 1 astronauts (from left) Gus Grissom, Ed White and Roger Chaffee pose in front of Launch Complex 34 which housed the Saturn 1 launch vehicle. The vehicle unexpectedly caught fire Jan. 27, 1967. O nly the United States, Liberia and Burma still primarily use English units  the rest of the world is metric. And now the moon will be metric too. NASA has decided to use metric units for all operations on the lunar surface when its astronauts return to the moon. The Vision for Space Exploration calls for returning astronauts to the moon by 2020 and eventually setting up a manned lunar outpost. The decision is a victory not only for the metric system itself, which by this decision increases its land area in the solar system by 27 percent, but also for the spirit of international cooperation in exploring the moon. The decision arose from a series of meetings that brought together representatives from NASA and 13 other space agencies to discuss ways to cooperate and coordinate their lunar exploration programs. Standardizing on the metric system was an obvious step in the right direction. The meetings, which began in April 2006, included representatives from the Australian, Canadian, Chinese, European, French, German, British, Indian, Italian, Japanese, Russian, South Korean and Ukrainian space agencies, all of which are either planning or considering some form of lunar exploration. NASA will use metric system for lunar missions Agreeing to use a single measurement system will make the human habitats and vehicles placed on the moon by different space agencies more compatible with each other. That could come in handy if, say, one agencys moonbase needs emergency spare parts from another agencys base. No need to worry about trying to fit a 15-millimeter nut onto a 5/8inch bolt. A metric standard will make it easier for countries to form new partnerships and collaborations after their lunar operations are already in place. All data will be in compatible units, whether its scientific data or operational data  such as how far a rover must travel to reach the edge of a crater. A single measurement system will make sharing this data and merging operations more seamless. Although NASA has ostensibly used the metric system since about 1990, English units linger on in much of the U.S. aerospace industry. In practice, this has meant that many missions continue to use English units, and some missions end up using both English and metric units. The confusion that can arise from using mixed units was highlighted by the loss of the Mars Climate Orbiter robotic probe in 1999, which occurred because a contractor provided thruster firing data in English units while NASA was using metric. Page 8 SPACEPORT NEWS January 26, 2007 John F. Kennedy Space Center Managing editor. . . . . . . . . . . . . . . . . . . William Johnson Editor. . . . . . . . . . . . . . . . . . . . . . . . .Jeff Stuckey Copy editor . . . . . . . . . . . . . . . . . . . . .Corey Schubert Editorial support provided by InDyne, Inc. Writers Group.NASA at KSC is located on the Internet at http://www.nasa.gov/centers/kennedyUSGPO: 733-049/600125 Spaceport News Spaceport News is an official publication of the Kennedy Space Center and is published on alternate Fridays by External Relations in the interest of KSC civil service and contractor employees. Contributions are welcome and should be submitted two weeks before publication to the Media Services Branch, IDI-011. E-mail submissions can be sent to Jeffery.Stuckey-1@ksc.nasa.gov. KARS Flyers group enjoys remote control aircraft By Jennifer Wolfinger Staff Writer K ennedy Space Center may be home to massive, cutting-edge spacecraft, but its also the base for the KARS (Kennedy Athletic, Recreation and Social organization) Flyers group which remotely pilots model airplanes and promotes the hobby of remote-control aircraft construction and flying. Approximately 50 people make up the group, which flies aircraft with wingspans ranging from two to 12 feet. All members belong to the Academy of Model Aeronautics (AMA), a national organization which coordinates model aircraft activities in the U.S. and provides liability insurance and contest and safety regulations. For example, during flight activities, theyre required to form a safety line to separate spectators and aircraft. Ever since we formed the club, weve never had an accident of any kind, said founding member and President Ernie Reyes. We offer instruction at no charge and even provide the models and gasoline. A KARS pass and badge is all thats needed. Its a great way for older and younger people to enjoy an activity. Somebody showed me, so I feel like its my obligation to show somebody else. Children can learn a valuable lesson on teamwork and reading instructions, Reyes said. The group has also helped with NASA projects such as identifying requirements, testing sensors and avionics packages, and developing in-house expertise in remote control aircraft. Over the last 10 years, members have also supported community educators, the KSC Visitor Complex, Space Camp and mentor programs. One thing I always think of is the close history of NASA and the AMA, said Secretary/Treasurer Bill Woodward of Space Gateway Support. The two engineers that proved the space shuttle glide test would work did it by building and flying models of the 747 and shuttle, and using them as a test bed. Those two aircraft are on display in our national museum and those engineers are AMA members. In 2003, I flew technology aboard my 86-inch wingspan hand-built model airplane. The flight was to prove that models and the project they are working on were compatible, said Woodward. Vice President Doug Thomas of United Space Alliance looks forward to the clubs growth opportunities. With our primary flying field moving to KARS Park 1, special badging is not required for access, so members will then be able to bring guests to the flying field. The KARS Flyers hope to have more involvement with community educators in getting area youth exposed to remote-control aircraft, Thomas said. According to club member Jack Pfaller, people join for many reasons including for sport, relaxation and the joy of building. He has constructed and flown model airplanes since the early 1970s. Im involved in the hobby out of a love of aviation, said Pfaller of InDyne, Inc. Its such a thrill to fly at Kennedy Space Center, especially when we get invited to the Shuttle Landing Facility. Its a thrill to fly where the shuttle lands. Membership also gives people an opportunity to visit places at KSC that they wouldnt get to see through their jobs.KARS FLYERS group members enjoy use of the Shuttle Landing Facility during a recent fly-in. The primary flying field is located at KARS Park 1. T he Kennedy Space Center Human Resources Development Office is accepting nominations of full-time permanent NASA civil service employees of KSC to participate in fulland part-time doctoral and fulltime masters programs under the Kennedy Graduate Fellowship Program. The purpose of the program is to provide employees with the opportunity to complete residency requirements for graduate or postgraduate education to develop the expertise required to accomplish the centers strategic objectives. Sponsorship provides funding for tuition, fees and textbooks, and permits eligible employees to attend approved programs on a full-time basis for Graduate, undergraduate programs accepting civil service applications up to one academic year. The Human Resources Development Office is also accepting nominations of full-time permanent NASA civil service employees of KSC to participate in degree-granting programs at accredited colleges and universities under the Kennedy Undergraduate Studies Program. Applicants must have completed a minimum of 12 semester/credit hours and currently have a 3.0 GPA (on a 4.0 scale) to be eligible to apply. The deadline for applications for each of these programs is Feb. 14. Employees must submit applications to Karen Milford/ CNI-3, Kennedy Learning Institute, Room 1002. Visit the Kennedy Graduate Fellowship Program Web site at www.http:// ba.ksc.nasa.gov/kgfp.htm or the Kennedy Undergraduate Studies Program Web site at www.http:// ba.ksc.nasa.gov/kusp.htm .